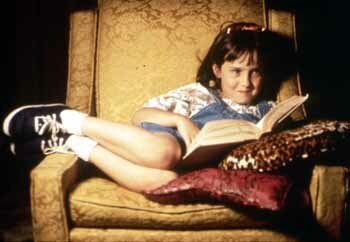 The first book based movie I ever saw was Matilda. Read a great post on the movie HERE. Recently, I've modified my opinion. I find that if I read a book first and then watch the movie, I am bound to be disappointed. For imaginative readers, reading a book is like playing the whole movie in your mind. No movie CAN live up to it. The thing is impossible. At every point you'll be searching for so and so scene, a certain character, or the perfect manner of speaking the dialogue. At best, you can find a movie enjoyable, but rest assured there will be something everyone doesn't like. It doesn't even have to be the same thing, but according to each reader's taste, everyone will find some flaw. But if you watch the movie first, without reading the book, and THEN read the book, there is a chance that you just might like the film adaptation and say that the book was great, but the movie was good too! This is because one, you don't go into the movie with so many expectations and two, because you can think of it as separate from the book (I find this truer for fantasy films, because the magic makes it much better to SEE things). The Lord of the Rings is my best example. I hadn't read the books when I watched the movies, and at the time, I thought the movies were good, not great. But after reading the books, I finds that I'm in love with both! With The Chronicles of Narnia, again I didn't read the books before watching the films and if anything I find the movies better than the books! Another great example is Little Women. I saw the movie a long time before I decided to read the book, and I find the movie very good. 2. If you read the book before watching the movie, chances are, you won't like the movie. So, now I've come to another conclusion! If I read a book like Matilda, The Lord of the Rings, or The Narnia series, chances are its movie will be fun to watch (even The Three Musketeers which is more action then romance is enjoyable even though the movie doesn't stick close to the plot! ), but with something intense like Gone With the Wind which depends totally on character - not so much. The book will always be better than the movie in such cases; doesn't matter if you read it first or after. I should stress that this is something I've personally felt. Doesn't have to be the same for everybody. I still have to read books such as Something Borrowed, Stardust, and The Devil Wears Prada to form my opinion on contemporary books transformed into movies (along with A Walk to Remember and Dear John).